Spread across two sister properties, El Taj Oceanfront and Beachside Condos is a masterpiece of luxury and design. The property offers five star amenities, a prime beachfront location, excellent service and decor and furnishings that are evocative of the tropical paradise of Bali. Onsite you’ll find a state-of-the-art fitness center, one of the trendiest beach clubs in Playa del Carmen and a deluxe spa. In each condo you’ll find fully equipped kitchens, spacious rooms and comfortable beds outfitted with deluxe linens. 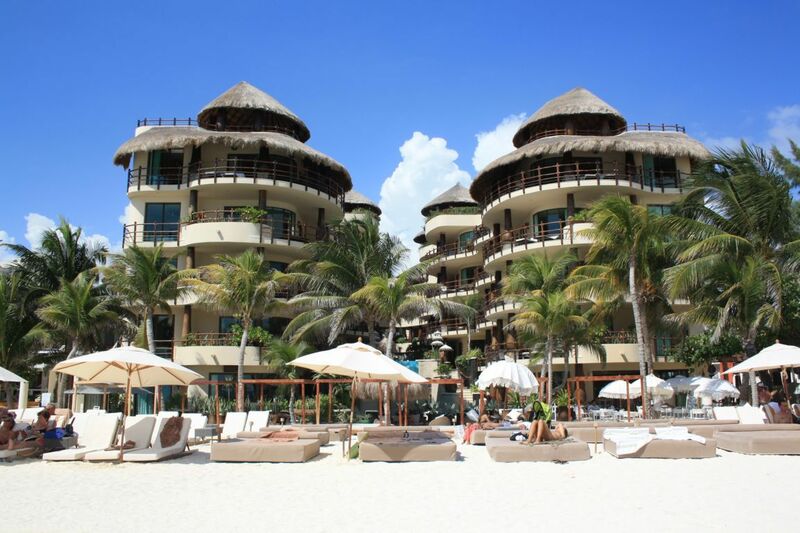 El Taj Oceanfront and Beachside Condos is located in downtown Playa del Carmen, halfway between Cancun and the world-class ruins of Tulum. Contact us or CHECK RATES HERE. Each condo in El Taj Beachside has a private terrace with views of the pool. In addition to a full kitchen with cooking and serving utensils, each condo has WiFi, flat screen satellite televisions, DVD player, hair dryer and iron. Condos from 1-4 bedrooms are available. For the ultimate experience upgrade to the 4 bedroom, 5 bathroom penthouse condo which includes ocean views from the private rooftop terrace that has a barbecue and outdoor kitchen, 2 dining areas and an oversized living space. Each of the 1 to 4 bedroom condos at El Taj Oceanfront comes with the same amenities that are offered at El Taj Beachside and each includes a view of the Caribbean Sea. Wedding groups of all sizes can be accommodated at El Taj. A well-deserved reputation for delivering dream weddings is attributed to flexible options and packages along with an attentive and experienced staff. Contact us for group rates and additional perks for your group. The Maya Spa offers pampering and indulgence for all the senses. To help relax and recharge the body select a chocolate body wrap, a deep tissue massage or a soothing facial. To add a bit of glitz enjoy a pedicure or hair braiding.